We love a good pasta al forno (oven-baked pasta) loaded up with meat, garlic, tomato sauce, and bubbling-on-top cheese. With the cold weather coming on it's easy to be comforted by hearty meals each night, but that means packing on the winter pounds. Stay ahead of the game with this lightened up version of the classic Italian-American baked ziti dish. The noodle experts at Pasta Fits have amped up the protein using shrimp instead of ground beef or sausage, and added a pound of tender, nutrient-packed broccoli rabe (or use broccolini). 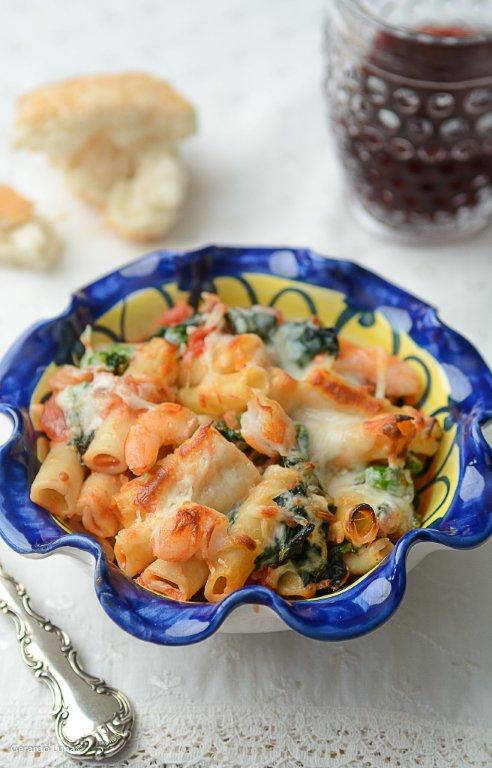 Just a few ingredients come together in a delicious baked pasta dish your waist and hips will love! Variations: try this with garlicky chicken in place of the shrimp, or bulk up on the vegetables and add roasted red peppers along with the broccoli rabe. 1. To make the tomato sauce, heat a large saucepan over medium heat. Add 1 Tbsp. of the extra virgin olive oil and the onions. Sweat the onions until they are translucent (about 5 minutes). Add 2 Tbsp. of the garlic and cook until aromatic, about 1 minute. Add the tomatoes and simmer until the flavors meld and the sauce thickens a bit (about 15 minutes). 2. While the sauce is cooking, bring a large pot of salted water to a boil. Cook the broccoli rabe until tender, about 5 minutes. Remove from water, reserving the water to cook the pasta. 3. Cook the ziti according to package directions. Drain and reserve. When broccoli rabe is cool enough to handle, roughly chop it. Reserve. 4. Heat a large saucepan over medium heat. Add the remaining olive oil and remaining garlic. Cook until aromatic, about 30 seconds. Add the shrimp and cook until just pink (about 1 minute). Stir in the broccoli rabe, sauce and pasta. 5. Transfer to a 9” x 13” pan. Sprinkle with the mozzarella and Parmigiano. Bake until heated through and the cheese is golden and bubbly (about 20 minutes).